by Jose Hong. The Straits Times, 05 Jun 2012. SEA walls defend the coast from erosion by waves and currents, but they are also potentially ‘housing developments’ for marine creatures. These ‘housing developments’, however, are not ideal habitats. This is because the granite blocks making up these sea walls have steeply sloped, even surfaces – not the best for sea life looking for crevices to anchor themselves, feed, breed, or hide. Research assistant Lynette Loke, a 24-year-old doing her master’s in science at the National University of Singapore (NUS), wants to change that. Her project now basically ‘renovates’ the sea walls by mounting specially designed tiles onto their surface. Designed and created by her, these tiles are moulded with ridges and pits, making them a more complex surface than just granite alone. She has been at this for 21/2 years, and will complete an analysis of the effectiveness of the tiles only next year. But her project has already garnered international praise. Professor Gee Chapman, a professor of marine ecology at the University of Sydney, was impressed by the project when she visited NUS in March. She said the research would answer important questions about how plant and animal species that live between the high- and low-tide levels use their habitats. ‘More importantly, the results will provide advice to ecologists, engineers and environmental managers worldwide about ways in which sea walls might be modified or built to reduce their negative effects on local inter-tidal biodiversity,’ she added. Dr James Reimer, an associate professor at the Molecular Invertebrate Systematics and Ecology Lab of the University of the Ryukyus in Japan, has also come to hear of Ms Loke’s work. Saying the project fit well with his work of assessing the impact of coastal construction on marine biodiversity, he invited the principal investigator of the project, NUS assistant professor of biology Peter Todd, to give a talk on the project in April. Dr Tjeerd Bouma, a co-principal investigator for Ms Loke’s project, noted that sea walls have been built for decades with little thought to their impact on marine life. Dr Bouma,who is a researcher from the Royal Netherlands Institute for Sea Research and Deltares, said learning how to design these walls in the most ecologically friendly way was therefore important. 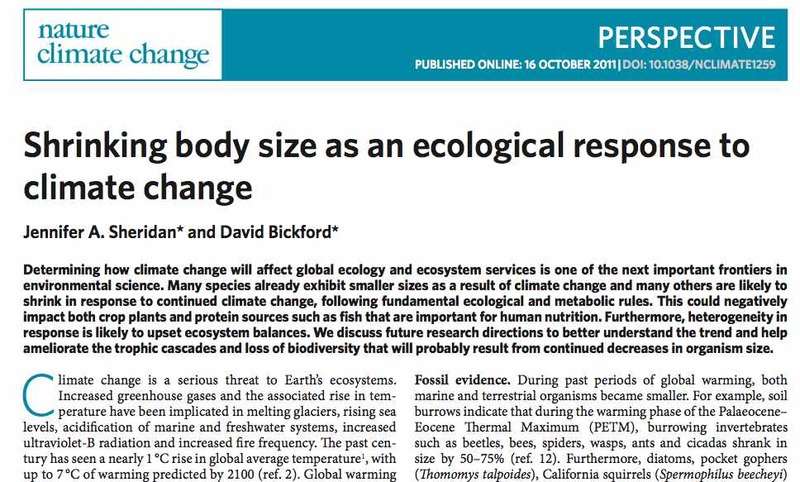 Our former postdoc colleague Jennifer Sheridan, who just recently moved on to a new post at the University of Alabama and resident herpetologist David Bickford have recently published an article in Nature Climate Change entitled “Shrinking body size as an ecological response to climate change”. They compiled evidence of how warming temperatures may lead to various taxa becoming smaller. The article is an interesting read and has been widely covered by the media including CNN, New York Times, Yahoo and hilariously, even The Onion. David hopes that this perspective piece stimulates discussion and future scientific study in this area. Let’s hope that it does! Where has all the flora gone? The Straits Times Forum, 30 Sep 2011. Singapore’s national flower is a sterile hybrid of two orchid species, both of which do not naturally occur in Singapore. It was the result of a cross made by Armenian horticulturist Agnes Joaquim in her garden, as described by pioneer botanist Henry Ridley. I am not sure if ‘extinction’ seems to be an ecologically relevant concept to apply to it, but as this is our official national flower, Mr Lim’s concerns are understandable. As conservation scientists, we often ask: How many of Singapore’s native plant species have become extinct? How many are in danger of becoming extinct? The latest edition of Singapore’s Red Data Book lists some 30 per cent of more than 2,000 plant species native to Singapore as nationally extinct. Many have been rediscovered in the following years, but many others remain rare – only a few of them exist in a few locations. One particular native species of interest is the Singapore Kopsia. It is found only in the freshwater swamps of Peninsular Malaysia and Singapore, and its flowers bear the Singapore colours: red and white. Another species of interest is a climber known to be found only in Singapore and nowhere else, with the scientific name Spatholobus ridleyi. If this climber becomes extinct in Singapore, it also means that it will disappear permanently from the face of the earth. Unlike hybrid orchids that require artificial propagation, our native plant species are fully capable of reproducing and surviving on their own – if not for habitat destruction and disturbance by us humans. Perhaps we should grow more native plants in all schools. This will enable our children to know and appreciate our gradually disappearing natural heritage. 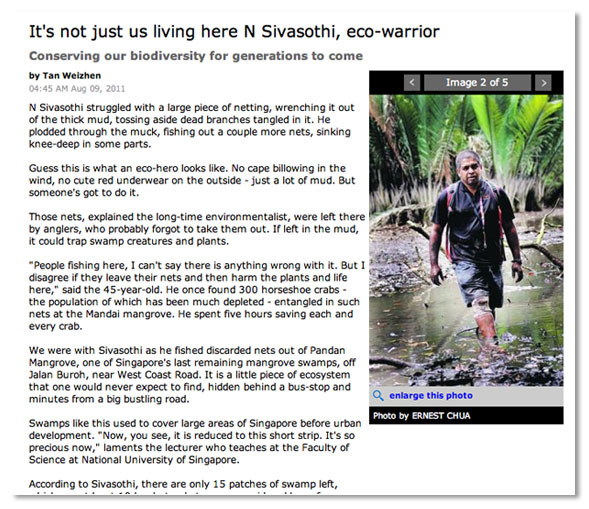 The Straits Times Forum Online, 30 Sep 2011. IS SINGAPORE’S national flower, the Vanda Miss Joaquim, becoming extinct? Is it difficult to grow? The only place where I can see the national flower is at the Singapore Botanic Gardens. The Singapore Tourism Board or National Parks Board should provide a list of places where we can view the national flower. We should grow the national flower in all schools. This will enable our children to know and appreciate our national flower.